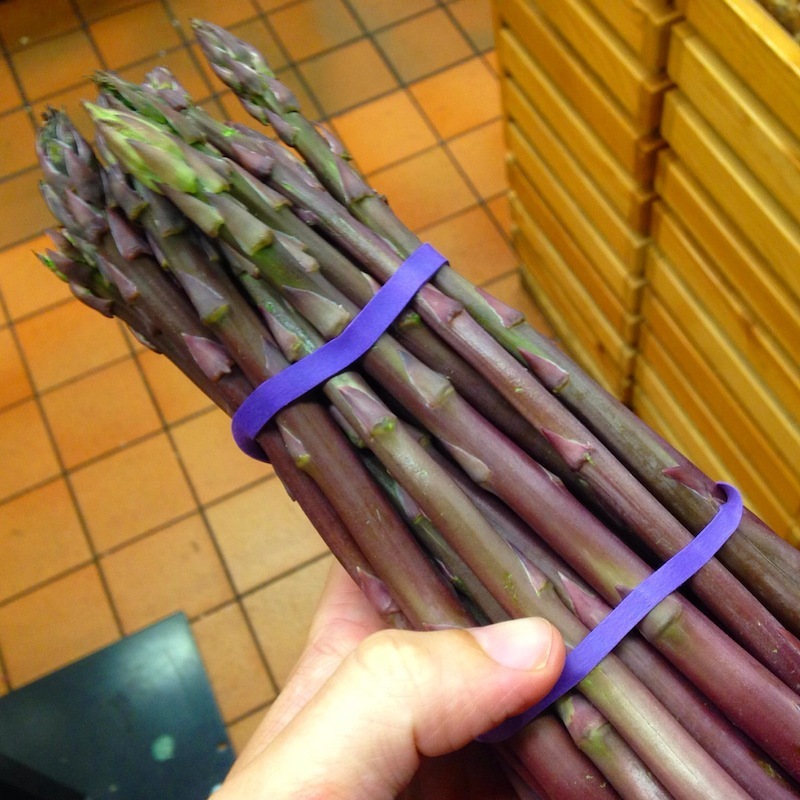 Check Out This PURPLE Asparagus! Then Check Me Out On Periscope! | Keep It Up, David! Check Out This PURPLE Asparagus! Then Check Me Out On Periscope! It’s beautiful. And a little pricey: six bucks a pound at Whole Foods. But I’d kick myself if I had left without it. So, I brought some home! I decided to grill it, because I love grilled veggies and my friend Jen just gave me a cast iron grill pan. How did it go? Deliciously. I documented the entire cooking process on Periscope. Are you on Periscope? It’s a live-streaming app where you can watch (and interact) with broadcasters around the world. I set up my account on Friday night, and on Saturday morning, I did a LIVE cooking show, where I grilled up this asparagus. It was an exciting experience. Viewers asked questions and made comments, live, that I responded to. I lost my power for a couple minutes halfway through (thanks to a rare thunderstorm in Los Angeles – only the second one I’ve experienced in 13 years), so it was fun improvising until the lights came back on. If you’re on Periscope, you should follow me. I plan on doing more broadcasts. I’m ‘KeepItUpDavid’ (naturally). One of the downsides of Periscope is that broadcasts are only archived for one day. So you can’t go back and watch it now. Don’t worry, I’ll do more, and I’ll try my best to give you a heads up here, or on Facebook, Instagram, and Twitter. 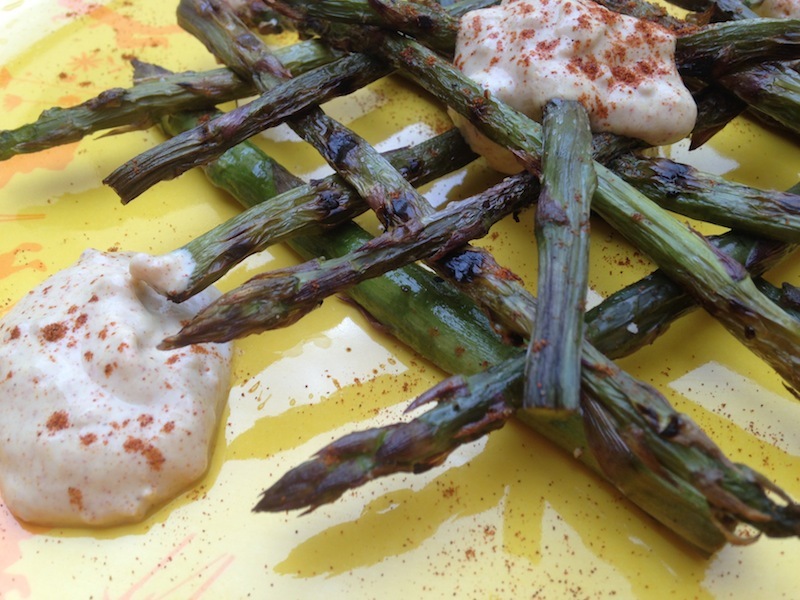 Here’s what I did with the asparagus – it was super easy. I coated the entire bunch with one teaspoon of olive oil, and sprinkled on some salt and pepper. Then they went into my pre-heated grill pan, where they cooked for about six or eight minutes. liberal sprinkling of paprika and turmeric. Stir it all up in a little bowl, and that’s it. I sprinkled a bit more paprika on top when I plated it – the paprika adds the smoky flavor (if you use smoked paprika, that is). Purple asparagus, by the way, tastes no different from green asparagus, and it grills up nicely. It gets tender and crisp, and the creamy sauce was a perfect compliment. I have a page that archives all the new-to-me and rare fruits and veggies that I try, and the purple asparagus is my latest addition! 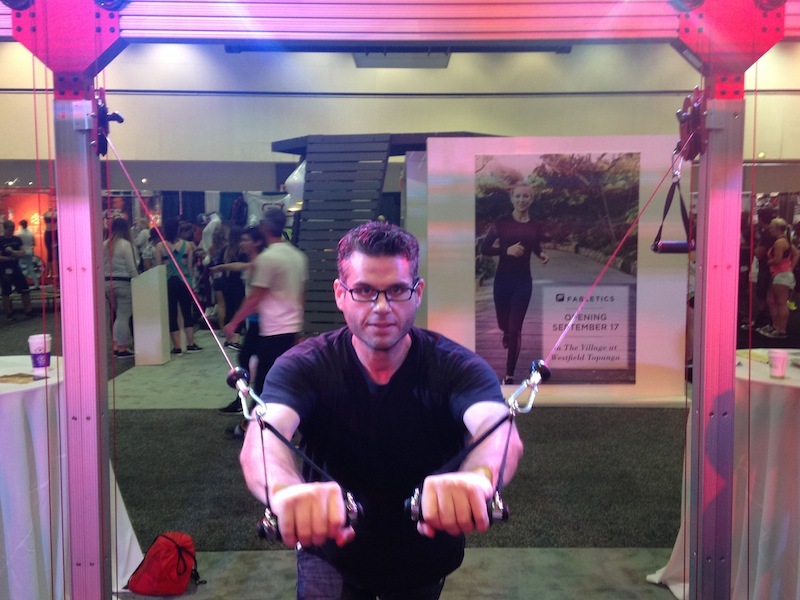 A little while after I made my Periscope cooking show debut, I headed downtown to IDEA World, an enormous fitness and nutrition expo at the Los Angeles Convention Center. I’m sure there were lots of awesome products and companies that had booths there, but I mainly went to see friends. 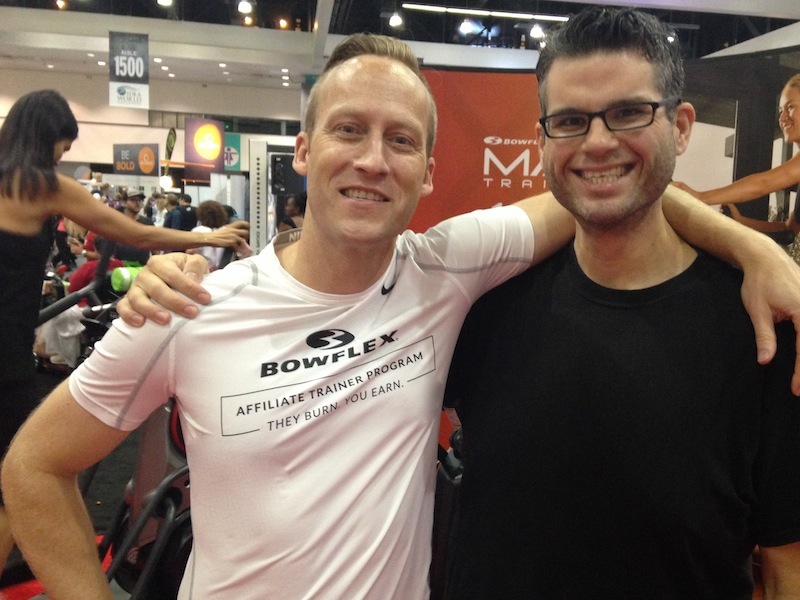 Bowflex had a big booth there, and my buddy Rob was manning it that day, and he’s great fun to hang out with. Rob moderated the webcast interview I did last summer at the Bowflex headquarters in Washington, and is one of the nicest, friendliest guys around. Lastly, I got to spent a little time with Leslie and Jaason, who are so fun to be around, and who pop up at every fitness-related event under the son. Leslie recently gave me an exciting exercise-related opportunity, and you’re gonna hear about that in an upcoming post. And if that wasn’t enough of a day, I also got in an hour-long workout (including Day 12 of the Bowflex Summer Strong Challenge), and went to a six-hour game night. Thankfully, I was able to sleep in on Sunday! This entry was posted on Monday, July 20th, 2015 at 12:40 am and is filed under Uncategorized. You can follow any responses to this entry through the RSS 2.0 feed. You can leave a response, or trackback from your own site. 4 Responses to Check Out This PURPLE Asparagus! Then Check Me Out On Periscope! My hubs is a big time asparagus lover. I could earn bonus wife points if I hit ’em with the purple kind. You’re looking great, David! 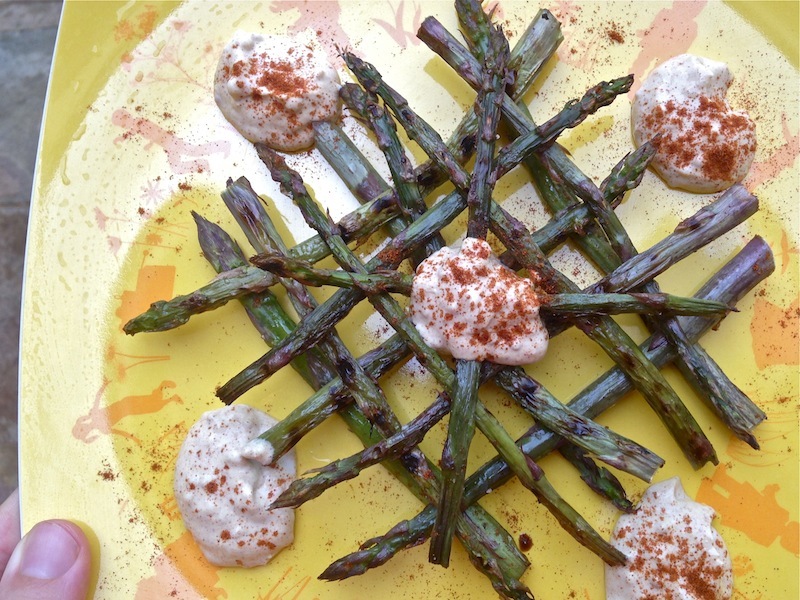 Asparagus is one of my favorite veggies and I’ve had purple asparagus before, though it’s pretty hard to find!